This KIT Version of our T2Plus-Switch gives you 6 Pure Analog pickup tones on any instrument with two separate pickup coils (either two single-coil pickups; two 2-wire humbucker pickups; or one 4-wire humbucker pickup). 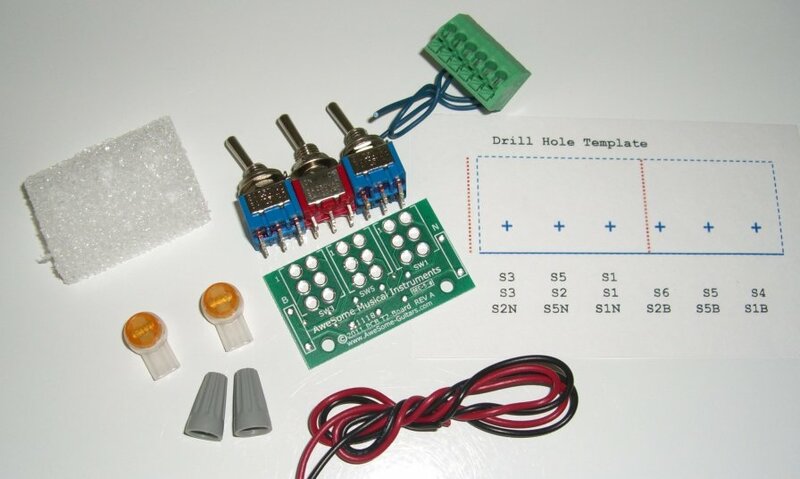 This is a do-it-yourself project that includes everything you need to install this upgrade into your electric guitar or bass. T2Plus-Switch gives you 6 pickup tones on instruments with 4-wire humbucker pickups. Use two of these switches side-by-side (instead of our T4-Switch) with two VT-1 stacked Volume-Tone controls (product #151) to separately control each 4-wire humbucker pickup. This "Plus" switch version also lets you use our DPDT (On-none-On) M2 Switch (product #142) to put all four pickup coils in series giving you a total of 102 pickup tones, several of which are QuadraBucker(tm) pickup tones. Switch SW1 controls the Bridge pickup. Center position is Off, Down is normal phase, Up is reverse phase. Switch SW3 controls the Neck pickup. Center position is Off, Down is normal phase, Up is reverse phase. 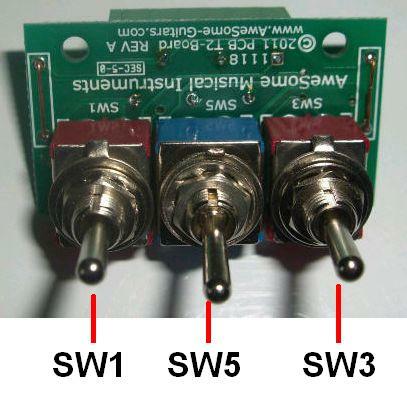 So with Switch SW5 in the Down position, you get the four pickup tones described above. You can turn on the Bridge pickup by itself, the Neck pickup alone, both the Bridge and Neck pickup together (in normal phase), as well as the Bridge and Neck pickup together (in reverse phase). When you put Switch SW5 in the Up position, you get the following two additional pickup tones with both pickups connected in Series. This gives you a warmer and more humbucking Jazz tone, that you just cannot get with your stock instrument. 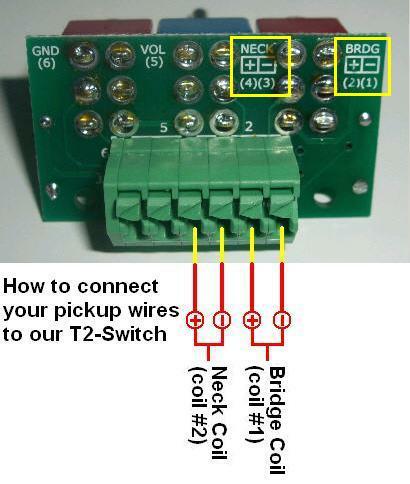 This page has MP3 audio clips to let you hear the result our T2-Switch upgrade offers you. Because you get a 30-day Return guarantee, you can buy this upgrade with confidence. Get 6 pickup tones on your upgraded instrument. You have nothing to lose except your lack of creativity.